News » Congratulations Trevor Coote! 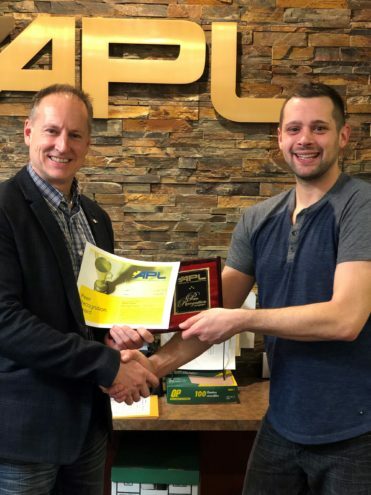 Please join us in congratulating Trevor, a PCP with our Peace River Flight Team, as this quarter’s well-deserved recipient of the APL Peer Recognition Award! Trevor has been recognized by his peers for his efforts in going the extra mile in his role and for placing a priority on workplace safety. Trevor has done an exemplary job of organizing the Peace River base and keeping it clean. The nomination stated that he makes sure the linens/biohazard bags are not full and takes them himself to the hospital for disposal. Trevor also ensures that the ambulance is in good working order. As a safety representative, Trevor is responsive and communicates issues and solutions well. He works hard on the SAAT plane and keeps it pristine. In recognition of his efforts, APL presents Trevor with the APL Peer Recognition Award. We are proud of Trevor’s accomplishments and thank him for all he does for APL! APL’s Peer Recognition Program is designed to encourage all field and office staff to recognize the outstanding achievements, contributions and efforts of their colleagues on a quarterly basis.